Sierra Cantabria Coleccion Privada Rioja 2014. Vinedos Sierra Cantabria was born as the result of the family’s on-going endeavour in their search for extracting the virtues of our collection of vineyards in unique wines, new classics that have turned into symbols of Rioja. 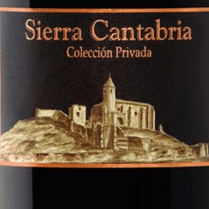 Sierra Cantabria Coleccion Privada Rioja This wine has a Intense cherry. Delicate nose, elegant with definite fruity expression, spice and subtle notes of petals and creamy traces of oak well integrated. Powerful palate, warm, complex, succulent, rich expression of toasty notes of oak and black fruit, coffee and chocolates. This red has established itself as a reference within its category. Bodegas Sierra Cantabria is another outstanding Rioja estate owned and operated by the Eguren family. The highlight of my visit in May, 2010 was a vertical of their two renowned single vineyard wines, Amancio and Finca El Bosque. Not to be overlooked is their complete portfolio of new releases, several of which are superb values. The Amancio cuvee comes from a single vineyard of the same name. There is a severe triage in the vineyard before the grapes reach the sorting table. It spends 24 months in new French oak using a “200% new oak” aging regimen before bottling without fining or filtration. The Finca El Bosque Vineyard is a 4 acre parcel of Tempranillo planted on gravel in 1972. The wine is put through ML in new oak and spends 18 months in new, mostly French oak.